A leading London advertising agency commissioned me to go to the UAE, and photograph two hotels for the Intercontinental Hotel Group. I stayed and photographed in their hotel at Abu Dhabi and also spent a day in Dubai at their sister hotel. The shots were to show how the hotel 'works', concentration on the staff and their daily working lives. 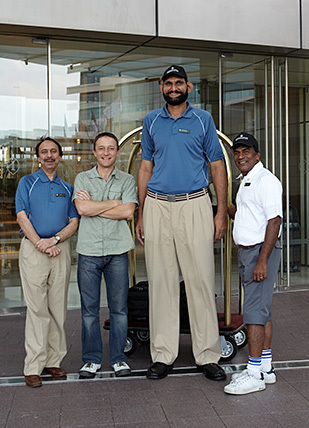 The photo below shows me (second from left) with a few of the Dubai staff, the tallest is Abdul Jabber at 7’2” (2.18m) - he is the tallest man in Dubai.